Seems like ages since I have posted a report mostly due to a home improvement project that turned into a nightmare where we had to fire our contractor and try and finish it ourselves. By God's grace, we were put in contact with a friend of the original owner who was a contractor that has almost single handily completed the project! As a reward I have been promising him a fishing trip but of course, most weekends were taken up on the project. Well with the job almost completed now I asked if he could get out this Saturday for some Lake Sammamish trolling for cutthroat and a possible hatchery coho! He jumped at the offer and was more excited then most kids I have taken fishing! Don't think he slept much as he showed up at my house at 7 am as giddy as a school boy! We set off for the lake on a sort of drizzly cold morning so wasn't sure of what to expect today and was concerned with the dropping pressure it may be a tough day fishing. Got to the launch and talked to a guy who was just putting is saying did well a few days ago going 2.0 to 2.2 MPH on a green kokabow spinner at 15 feet down. I have ignored free advise before then wishing I had listened so decided to start the day with green colors on both my lead core line and the down rigger. Tipped both with night crawlers and proceeded to troll from the weather buoy to the west side of the lake without a bump. Around 11:30 am when at the north end of the west side decided to go across to the east side because I had received another tip that she had done well over on that side. Of course we tried different depths, different colors, different scents but still no love! Pulled the ace out from under my sleeve and called Paul Lewis to see if he had any helpful hints. He also said it was slow before he left back to school but to try deeper and slower with the pressure drop; while I was talking to Paul my fishing partner pulled up the you tube video that we filmed back in 2016 with Mike Carey and co. He said "hey why don't you try that lure you switched to in the video?" Why not! I pulled in the lead core and switched to a pink kokabow tipped with pink gulp maggots and let out 120 feet this time to get deeper and no more the 2 minutes went by when BAM!!! Fish on! Craig almost jumped out of the boat as he leaped up to grab the rod! Just as he got it close and it was doing the roll it came unbuttoned- darn! OH well at least it was some action so once again tipped it with new maggots, dipped it in super dipping sauce and let it back 120' and wouldn't you know it BAM!! Another fish on! This time he played it smoothly and soon it slipped into the net and I said " yes in the net!" and then Craig said no it's not! What? 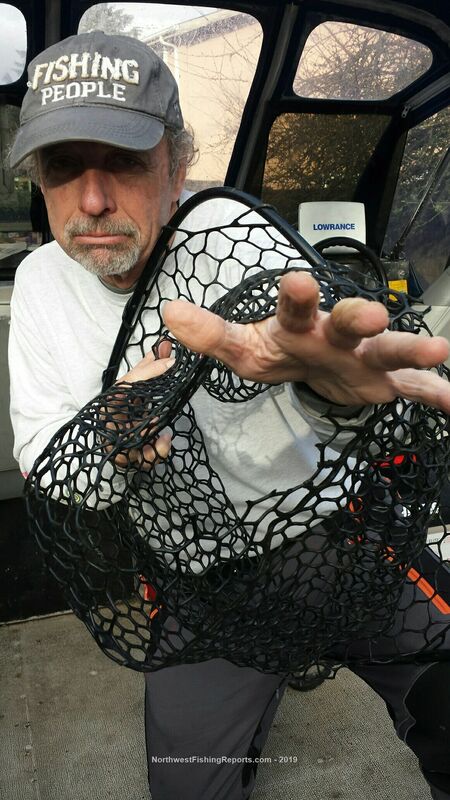 It had gone right through the bottom of the net as it seems a critter must have got into my boat again and this time chewed away the whole bottom of my net! Yikes! 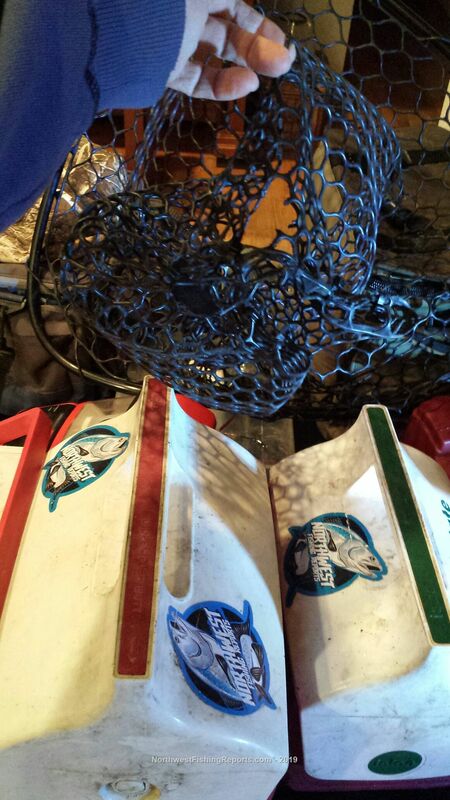 So we hauled it up over the rail and into boat with losing it luckily and finally did our high 5! Set both lines back out with pink and maggots and once again the lead core went off! BTW all 5 bites today were on the lead core; not 1 bite on the rigger rod! This time he gets it in and it looks like a coho or a kokanee but without a net we have to make a quick observation as it gets close and I can see no adipose fin- I can also see a white gum line so haul it in and it's a coho! Craig is happy as he promised his girlfriend to bring home some table fare and you can't go wrong with these 2 so far! We ended up losing 2 more and with one real close to the boat and another further out but all-in-all not too bad a day for us as most of the reports we got from others out there said it was pretty slow with no more then 1 caught per boat we passed or saw back at the launch. Was glad I had the chance to get him out today and even happier he caught a couple fish! Now he says he'll help us with our fence that needs repairing so we have a good working relationship here haha! Did get the net repaired back home with some zip ties so it's ready for the next trip! View other reports from salmonbarry. Enjoyed reading your very nicely done fishing report. 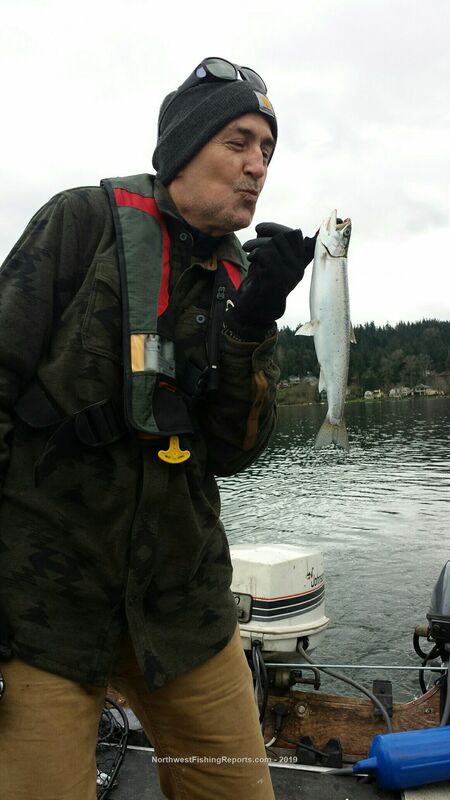 Although my fishing partner and I were not out on the lake today, I did receive a briefing from a friend who fished Lake Sammamish today with his friend. He said there were about 15 vehicles with trailers at the launch site when they pulled into it. 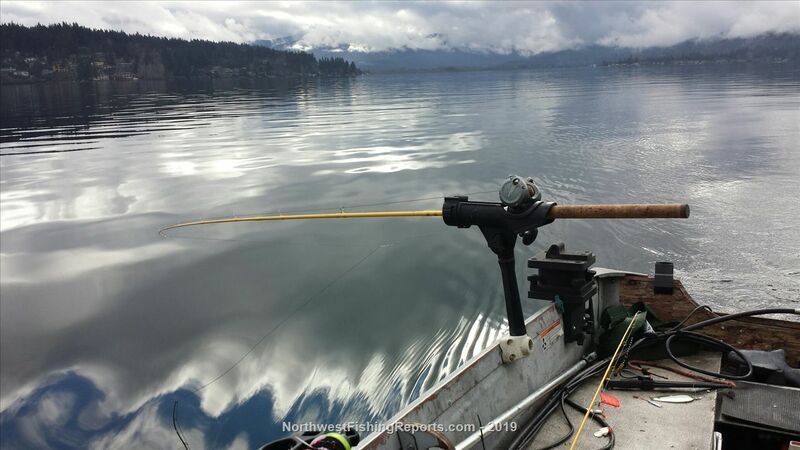 He reported much the same type of fishing action that you and your partner encountered today. And like you, he is a very good fisherman. He and his partner fished the late morning into the early afternoon hours, about 4 hours, and came away with 2 Cutthroat landed which were released to the lake and they had a couple of missed strikes. He said he saw very few birds working the lake today which likely means the recent bug hatch has pretty much run its course. My experience of fishing the lake is that once that happens, the fish tend to scatter widely making the catching a lot more challenging. 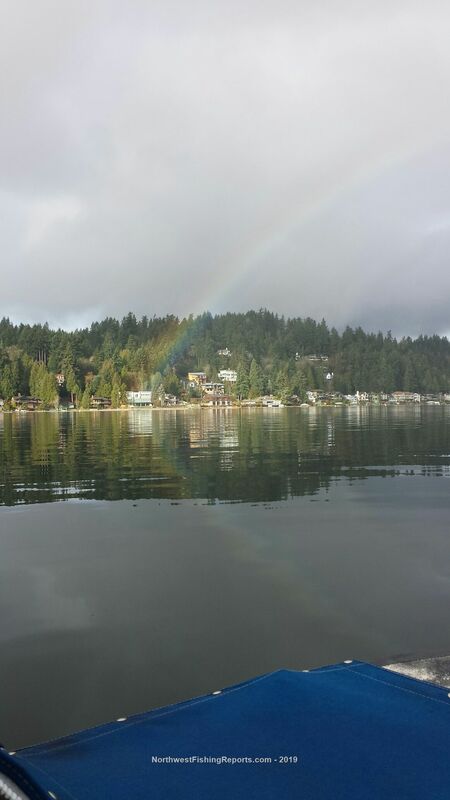 But with that said, its always just nice to be out on the water enjoying some peace and quiet. @sharphooks! Thanks for the kind words- yea last time out I didn't get into fish until after noon so may change my approach next time out and start later. Funny thing was there were tons of midges around almost to the point where I felt the fish could be stuffed but as your friend stated, not a lot of bird activilty! Still was a fun day for my friend and he and his girlfriend enjoyed a nice meal last night! Salmonbarry, I can’t thank you enough for the outting!! Full disclosure, I was beginning to think there were no fish in the lake......BOOM, I was wrong!!! The long wait just makes the bite that much sweeter, and how sweet it was. As I said, my face hurt from smiling for 3 days in anticipation of the trip, and I was not disappointed. What an awesome day, I learned sooo much from you Salmonbarry, but the memories from this trip will last me a lifetime.....thank you so much!!!! ???? Thanks Craig and welcome aboard the site! As I have said "the tug is the drug' and worth the long wait- glad you enjoyed yourself and it was pleasure having you on the Tin Cup! PS Will you be fishing the Something Catchy Derby? Andy we need to talk to Bryan and DJ- thinking of teaming up so let's do some PM's and come up with a plan! 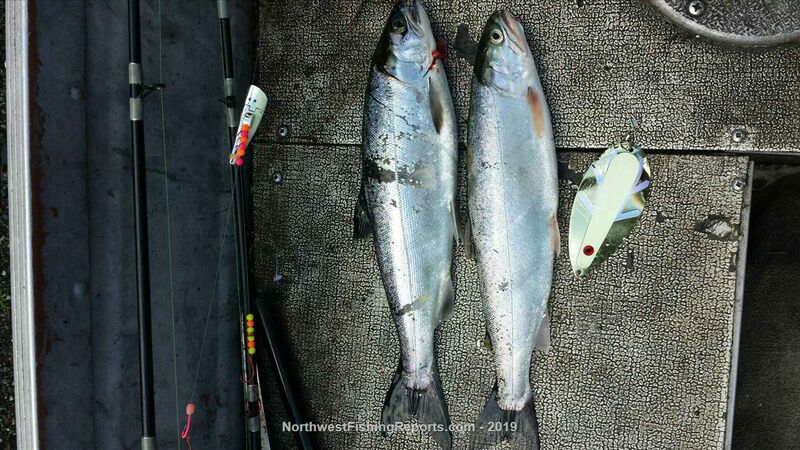 I have to admit, I have probably been releasing coho thinking they were kokanee. Looking for the missing adipose fin seems like the best way to determine the species. The speckled dots and the difference in eye size sometimes is a bit iffy. Thanks Ben! Yes the best way is just like in the salt is to look at gum line- very evident when it's a king and all black! But definitely the smaller ones are harder to tell!